Real estate closings are definitely on the rise and oh what a difference a year makes. Currently we are seeing roughly 28% more real estate closings every day in the Tallahassee real estate market compared to just one year ago, and the two real estate graphs in this report provide the context to see exactly how far we have come and yet have to go. 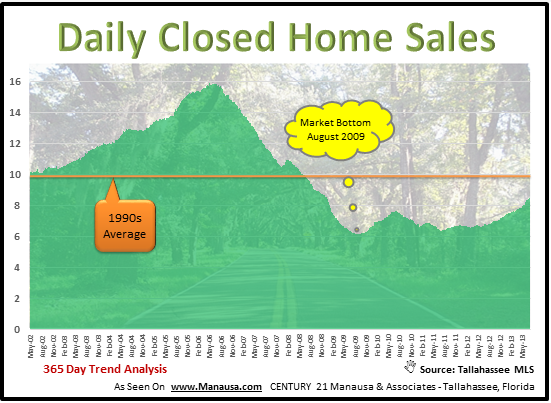 Each of the two real estate graphs that are featured in this article show daily closed home sales in the Tallahassee real estate market. The first graph zooms in to the most recent five years, whereas the second graph provides a historic look at real estate closings. 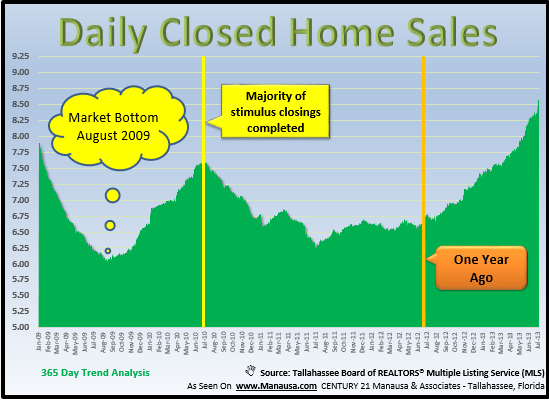 In August 2009, the Tallahassee MLS showed a market bottom at just over six home sales each day. Currently, we have seen the daily number of home sales trend over 8.5 each day, which represents a growth of 37% since the bottom and a 28% rise over this time last year. Our next graph shows historic real estate closings in Tallahassee going back to 2002. As a reminder this graph shows the one year trend of daily closed home sales. This means that each point on the graph represents a 365 day average, thus our trend is able to remove seasonality from the results. This means that any direction change that we see from the data represents a real change in the market as opposed to a fluctuation due to a time of year issue. Finally, the orange line shows the average number of daily closed home sales during the 1990s. I include this merely as a reference line to provide context to the peaks and valleys in this graph. One would think that due to the rise in our population compared to the 1990s, we should be seeing more home sales this decade than in the past, and I believe it will come to pass as the market cycles level out. The current rate of daily closed home sales is still about 14% below what we averaged in the 1990s, but we certainly have pushed the recovery off of the real estate market bottom. If you would like to know more about how the current real estate closings impact the value of your home, just drop me a note and we can schedule a time to review your specific situation.